Type location Kenya (Ponera Jeanneli n. sp., Santschi, 1935b: 262, illustrated, worker) (new combination in Hypoponera, Bolton, 1995) . Santschi's (1935b) description is at . 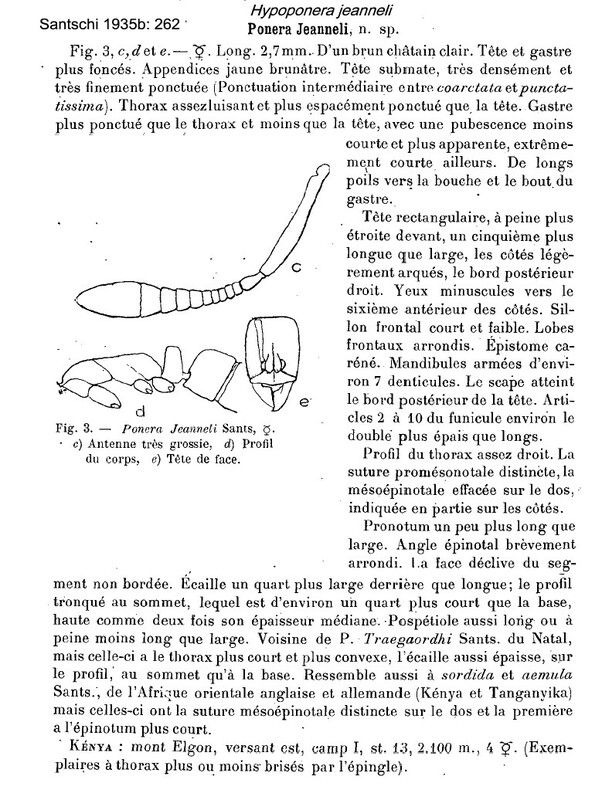 TL 2.7 mm; head rectangular 1/5 longer than wide, sides slightly arcuate, occiput straight; eyes minute set about 1/6 from anterior; scape reaching occiput; propodeum with short rounded angle, declivity not bordered; petiole 1/4 wider behind than long, truncate dorsally in profile, narrowing so dorsum 1/4 shorter than base; head submatt, very densely and finely puncturate, alitrunk more shiny, gaster more like head; pubescence more obvious; clear chestnut-brown, appendages brown-yellow. 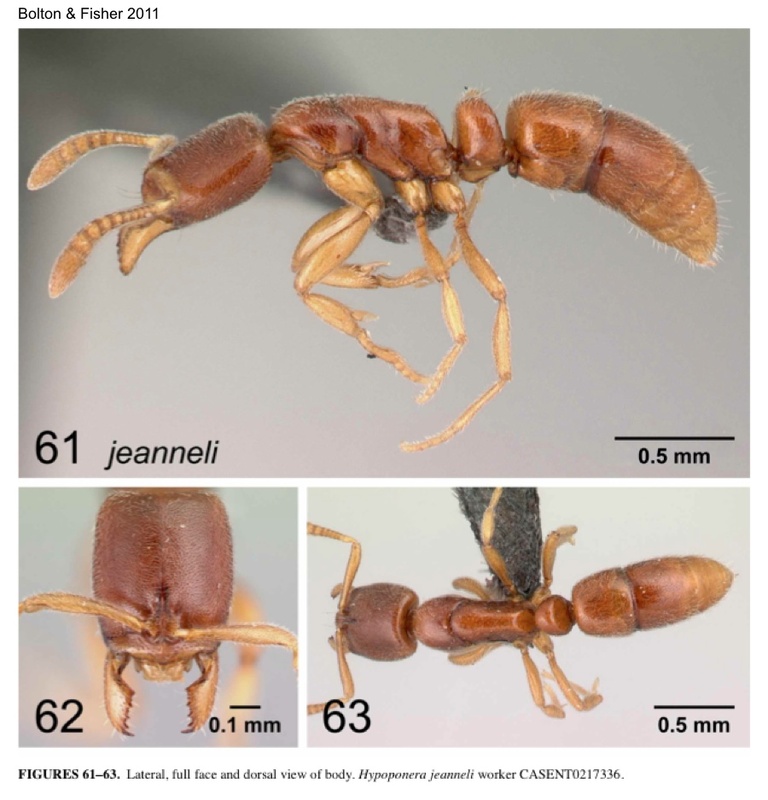 Bolton & Fisher's re-description can be found in http://www.mapress.com/zootaxa/list/2011/2843.html. 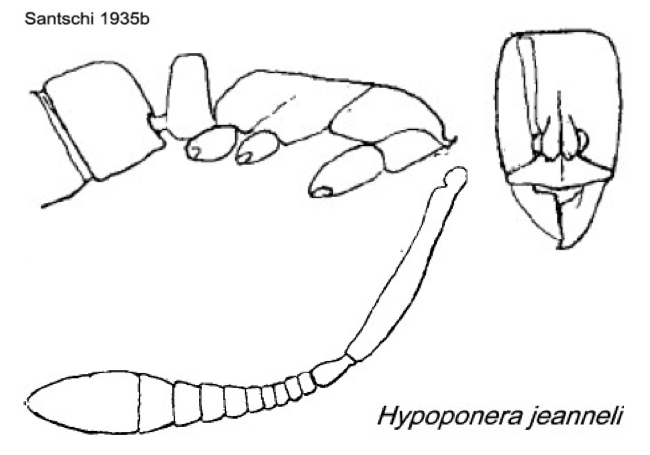 They synonymised Hypoponera imatongica and, provisionally, Hypoponera abyssinica under jeanneli. If my recognition of a worker from Tanzania is right the abyssinica form is significantly darker and shinier. They claim also that the cross-ribbing at the base of the cinctus is are strongly developed and conspicuous; if so, why are such ribs not visible in their photographs? The photomontage of the type worker is collated from http://www.antweb.org/specimen.do?name=casent0915198. The photomontage of a worker from Tanzania, Kilimanjaro, 5.ix.2005, Collector P G Hawkes; is from Bolton & Fisher (2011) and is also on http://www.antweb.org/specimen.do?name=casent0217336.